The esteemed loremaster Volothamp Geddarm is back! He's written a fantastical dissertation, covering some of the most iconic monsters in the worlds of Dungeons & Dragons. But the Sage of Shadowdale himself. Elminster, doesn't believe Volo gets some of the details quite right, Don't miss out as Volo and Elminster team up to illuminate on creatures both common and obscure. 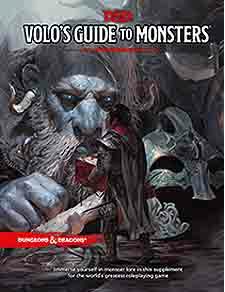 Sure to inspire any Dungeon Master, this book explores the stories and lairs of various monsters, including giants, mind flayers, orcs, and goblinoids. Players can also find rules for playing a variety of new races, including the angelic aasimar and the feline tabaxi. Also included are game statistics for scores of monsters - some new to the game, and some that hail from the game's past - which are ready to appear in D&D adventures as mighty friends or fearsome foes. For use with the fifth edition Player's Handbook, Monster Manual and Dungeon Master's Guide.